Fruit fly life cycle is an important subject to be studied. I am not talking about reading or writing type of study I am talking about knowing something interesting about your little opponent. Fruit flies life stage is a short span of time. But in this short span of time it creates a lot of nuisance among us. It’s a petite bug but infuriates us a lot. When fruit fly roam around you and your house it’s quite awkward as it gives you a feeling that you are a very unclean and grimy person. When I found some fruit fly in my home my mom scolds me too much. And repeated one dialog all the time that you are filthy that’s why this little insect visits you often. It’s quite embarrassing and I tried not to hear that procession again. I then started to make some serious study about fruit fly. And I am trying to inform you about that. Fruit fly life phase can be divided into 4 stages like other pests. They are- egg, maggot or larva, pupa and adult stage. 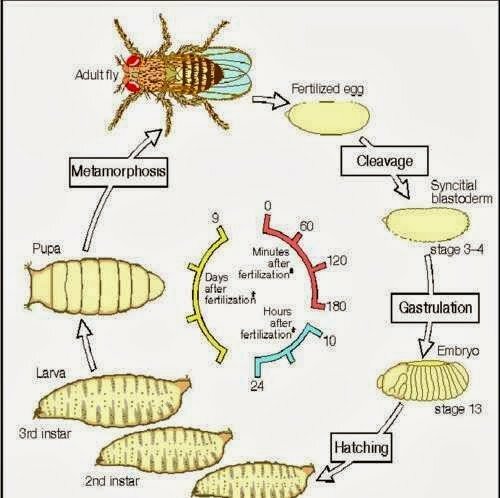 I am discussing about fruit fly life cycle below. A female fruit fly chooses a cozy place to lay her egg. It usually chooses an organic place. It lays egg to that kind of place because when their egg hatches they can get their food easily. That’s why most of the time female fruit fly lays egg on rotten fruit or vegetables. For fruit flies, temperature is very important. A female fly can lay her egg in between 21 to 38 degrees. If temperature is very low or very high there is possibilities for fruit fly to end their life cycle. A female can lay 200-500 eggs at a time. And it took 24 hours for female fruit fly to reproduce egg. The second stage is called larva or maggot. In the egg stage if conditions are fulfilled then eggs can hatch to larva stage. They took about 4-5 days to come in the form of larva. In the previous section I have told you that female fly love to lay eggs on rotten material or organic places. At the larva stage,those little miniatures swallow as many foods they can to become in a full form. This gives you a greater alert that if your vegetable or fruit is infected you must dump it as early as possible. Else it may cause some health issuing problem. In this stage metamorphosis takes place. Metamorphosis is a stage when a protective layer is made for the larva. They are called pupa at this stage. At pupa time fly comes into a shape. It builds a body, legs and wings. Just before becoming adult pupa turns darken. In this stage they do not eat. They depend on the food which was gauged by them at their earlier stage. Final stage of reproduction system of fruit fly: After staying at the pupa stage for 3-4 days it turns out as adult flies. This adult fly can lead their life up to 14 days. At this short time they found their mate and again starts its own life cycle.